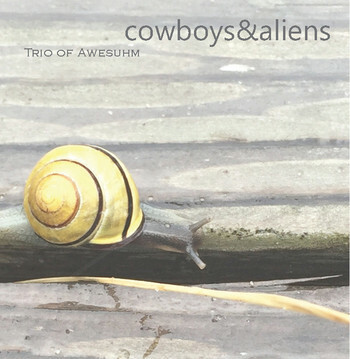 New York-based singer and songwriter Monica Uhm has intricately weaved a delightful buffet of organic melodies under the band moniker Trio Of Awesuhm, a name that includes the collaborative efforts of the musicians who contributed to the “cowboys&aliens” album. Monica’s vision was to originally record a folk music album, whose sound expanded into the genres of Americana, blues, country rock, and acoustic pop from the flavorings of talented artists that worked on the project The album is an intelligible journey that is uniquely soulful and warm to the ear. The single Nevertheless off the cowboys&aliens album reveals much of the musical creativeness behind the project. Nevertheless is a catchy tune that truly comes to life through its acoustic guitar rhythms, piano riffs, and charming bassline. Monica’s vocal performance is distinctively attractive as her melodic presentation always brings listeners into the room. The song’s lyrics are quite inspirational and encourages the listener to never give up on their dreams or bow down to ideas of relinquishing our freedoms as a nation. Nevertheless by Trio Of Awesuhm is folk music’s lucky charm.